Now that we’ve got our own offices, and I’m free of the super restricted corporate firewall we we’re previously (and kindly) bludgeoning off, I was really excited at the prospect of using GMail’s IMAP capabilities and finally being able to use Mail.app. I have tried and tried and tried and tried to persevere with Mail.app and IMAP, but no matter how hard I try I still gravitate back towards browser based Gmail. Are there some uber-tips and uber-features I just haven’t seen? At this stage, Gmail through the web browser wins hands down. Wow! 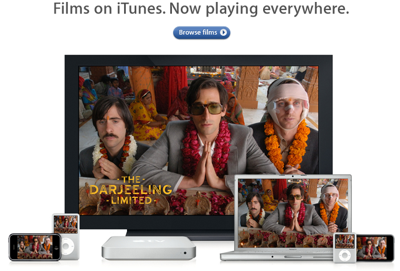 Imagine my excitement this morning when I opened my inbox and Apple told me I could now download films from iTunes. Kiwis – don’t get too excited. This was for my iTunes UK account. Bah! The saving grace is that there’s a good selection of TV shows, most of which you can download particular episodes. And kind of like iTunes music, it’s great being able to pick and choose the odd gem you’re after without having to buy the whole boxset/album. I’ll be buying the odd classic show and maybe the odd series you simply can’t get here. But for other mainstream stuff I’ll just rent or buy it from the DVD store. Call me an old fart, but if I like a movie or an album, I’ll go and buy it. I like something I can touch and feel. I like the cover. I can rip it. It’s not DRMed, and it’s automatically backed up.